We lost an hour last night. It’s that time of year here in Michigan to move all the clocks ahead one hour. A trick to make me believe I’m sleeping in too long. The Saturday Life Drawing I decided to share today is with my beloved Micron pen. I love these pens with their thin clean lines. And I love to scribble with them, mostly in some fashion of a circular motion. For the darker areas, I just keep scribbling and build up the ink. I like the flow of my hand continuing to move along on the paper, just building and building. There is a mindless freedom to this for me. It’s in contrast to the detailed colored pencil work I do. Even though both have a therapeutic effect on me, they work differently on my mind. Since I only have ten or twenty minutes to scribble up a figure, there’s an urgency in racing the clock. Somehow the fast scribbling releases any tension and stress lodged in my mind from the activities of the week. They get washed away in the movements of the pen. WOW….they look fabulous, Dee! I might try ‘scribbling’ myself sometime. Thanks, Serena!! Definately give a whirl. I just know you’ll enjoy it. Thanks for stopping by. Txs. 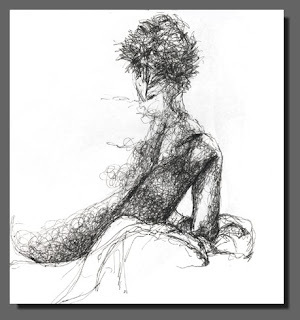 for stopping by my blog and I’m amazed at what a little scribbling can form. Great job. Hey Peachtreeart! Thanks for stopping in. 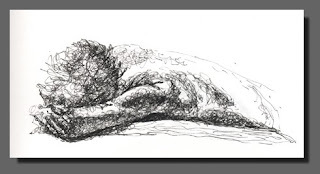 I was at an art show last week and saw an amazing ink pen Scribble piece that was something like 60 x 80″ in size. Now that took some scribble time!